Zirconium (Zr) (atomic number 40 and atomic weight 91.22) has density of 6.52 gm/cc. Melting point of Zr is 1855 deg C and boiling point is 4377 deg C. Zr has a hexagonal close pack crystal structure. The phase diagram of the Fe-Zr binary system is given at Fig 1. Zr is being used as a alloying element in steels since the early 1920s, but has never been universally employed, as have niobium (Nb), titanium(Ti), and vanadium (V). Historically, the main use of additions of Zr to steel was for combination preferentially with sulphur, to avoid the formation of manganese sulphide (MnS), known to have a deleterious influence of the impact toughness of wrought and welded steel. These days there has been a renewed interest in the addition of Zr to the micro alloyed steels. Zr is highly reactive and has a strong affinity, in decreasing order, for oxygen (O), nitrogen (N), sulphur (S), and carbon (C). Its affinity for O, S, and N is the primary reason for its use in steelmaking. Due to this property it controls the nonmetallic inclusions of sulphides and oxy-sulphides. it is also used for the fixation of N mainly in boron (B) steels. Zr also inhibits grain growth and prevents strain aging but its use for either of these reasons is limited. Because of its relatively high price and also due to the availability of cheaper replacements, general acceptance of Zr for use as an alloying element in steels is limited. Te Zr addition agents in the liquid steel are iron-silicon-zirconium (FeSiZr) alloy, ferrozirconium (Fe-Zr) alloy, Zr alloy scrap and pure Zr sponge. Out of these the most popular addition agent is FeSiZr since it is the lowest cost source of Zr available as steel additive. FeSiZr is available in several grades with Zr content varying from 18 % – 20 % to 40% – 45 %. This alloy is having high content of Si and its level is more than 40 % in all the grades. High purity Fe-Zr grades are produced from Zr sponge. It may contain between 40 % and 90 % Zr, depending on grade. Zr is always added in the steel teeming ladle. Addition in steel making furnace is not possible because of high O levels in the furnace which leads to very low Zr recoveries. Since Zr gets easily oxidized, it is only to be added to fully killed steels. Thermodynamic data show that ZrO2 is more stable at steel making temperatures (1600 deg C) than SiO2 or even Al2O3. However, its stability relative to that of Al2O3 reverses at lower temperatures. Precautions is required to avoid reoxidation of the liquid steel heat after Zr addition. The use of shrouded nozzles, multiport nozzles, non-turbulent teeming streams and synthetic slags help in improving recoveries of Zr. Use of basic ladle linings (e.g. MgO lining) helps avoidance of Zr to reduce the SiO2 or alumino-silicates found in acid refractories. When used as a micro alloying agent, Zr recoveries are invariably quite low. However it is to be noted that the function of Zr is not to remain in solution in steel but to scavenge O, S, and N impurities or modify inclusions through the formation of complex sulphides and oxy-sulphides. While Zr additions alone have little influence on strength of steels, enhancement in the ductility and toughness properties are linked to the high stability of Zr compounds formed during the steelmaking process. This in turn is very dependent on steel composition and steel processing route. Addition of Zr prevents grain growth at typical reheating temperatures around 1200 deg C. Also Zr delays austenite crystallization. Zr shows a great affinity for impurities such as O or C. It is also forms oxides or carbides, which act as a pinning dispersoid against grain boundary migration. Zr has strong ability to fix S and hence can be used as a partial replacement for manganese (Mn) to prevent hot shortness. ZrS is significantly more stable than MnS in steel. 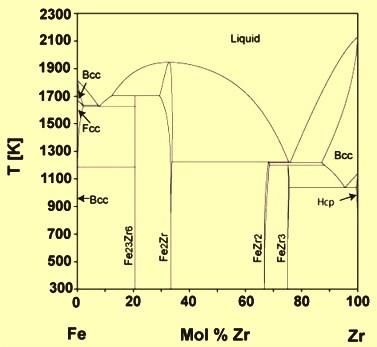 Therefore, if enough free Zr is available during the early stages of solidification of liquid steel, ZrS will form and prevent the formation of MnS. ZrS is much more refractory than MnS and practically non deformable during hot rolling while, in Al killed steels, MnS produces long flat stringer inclusions in hot rolled steel. The amount of S fixed is equal to (% Zr-0.15)/10 and S gets entirely combined when the Zr/S ratio exceeds 1.41, the stoichiometric value for ZrS2. Further, it has been observed that whereas a Mn/S ratio of 7.5 must ordinarily be maintained to eliminate hot shortness, the addition of Zr reduces the limiting value of (Mn + Zr)/S to around 5.0. Zr additions to low carbon and micro alloyed steels have been shown to be effective in improving toughness and ductility by forming (Mn, Zr)S inclusions, which are less plastic than MnS inclusions, and through grain refining of austenite, leading to a finer ferrite grain size. The fixation of S has a beneficial effect on transverse ductility and impact properties as well. Levels of Zr between 0.03 % and 0.30 % are known to prevent the formation of detrimental Type II grain boundary film sulphides. Zr is a globularizing agent of sulphide inclusions and hence tends to improve the properties of steel in the transverse and longitudinal directions and also to improve its machinability. Zr additions reduce the N content in steel which leads to a reduction in its tendency to aging and its hydrogen embrittlement as well as significantly lowering the steel’s flake sensivity. The efficacy of Zr addition is therefore measured not by the amount of residual acid soluble metal which remains, but by the extent to which inclusions are beneficially modified or, when so used, by the potency of desired B additions. The hardenability factor for Zr probably lies between those for V and Ti. Also there is no drop off in hardenability factor as the levels of Zr are increased. However Zr is not used for the sake of promoting deep hardening due to practical and economic reasons. The effects of Zr on the microstructures and mechanical properties of micro alloyed steels have shown that the microstructures in the Zr bearing steels are ferrite plus pearlite, which is similar to those in the Zr free steels. With the increase in the Zr content, the lamellar structure reduces and even disappears. Sulphides and silicates that exist in the Zr free steel are modified into fine oxides in the Zr bearing steel. When the Zr contents range from 0.01 % to 0.03 %, the low temperature toughness of the steel can be substantially improved while its room temperature strength and ductility have no apparent change. The refinement of ferrite grain size by the addition of Zr is one of the main reasons for this toughness improvement. The presence of Zr compounds, however, reduces grain coarsening, and thus permitting the use of higher hardening or carburizing temperatures. Zr produces only slight changes in the mechanical properties of quenched and tempered steels which are generally beneficial. It produces a more uniform distortion during heat treatment than other alloying elements like V.
Zr also raises the yield/tensile ratio and improves weldability through the reduction of under bead cracking and the elimination of porosity. In high alloys steels, Zr increases hardness but decreases ductility. In stainless steels, Zr retards the formation of sigma phase. Zr additions in steels can reduce the austenite grain size and increase dispersion strengthening, due to precipitation of zirconium carbonitrides, or in high nitrogen- vanadium–zirconium steels, vanadium nitride. When added to iron to create an alloy, Zr improves iron’s machinability, toughness, and ductility. Several quenched and tempered high strength low alloy (HSLA) steels have Zr content of 0.10 % to 0.15 % mainly for the purpose of sulphide shape control. These steels are used for general structural applications and have yield strengths of 550 or 690 MPa depending on their grades. Zr is also used as an alloying agent in steel, to make some types of surgical equipment. Zr bearing steel is also used for line pipes. Zr bearing steels are used for many military related applications especially for light armour.